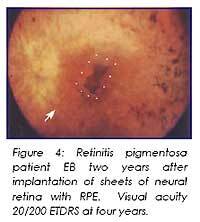 What are the results of retinal transplantation in patients with retinitis pigmentosa (RP) and dry age related macular degeneration (ARMD) since 2002? 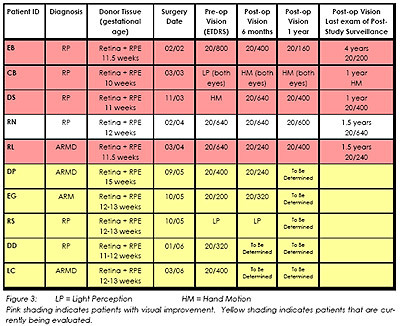 The table below (Figure 3) shows the current results for patients who received retinal transplants since 2002. Subjective comments from patients are also provided. At her 7-year exam, patient states that her husband was in hospital for three weeks and she could, in a strange environment, move around, see things he needed and brought them to him, traveled to nurses station in foreign environment which she could not do before. Now she can go to church and moves around freely without someone guiding her. In a restaurant she can move freely or in a grocery store which she could not do before. She looks at ingredients at the grocery store which she could not do before. A magnifying glass can help her with small print. She can now see more color and is better able to see light clothing in a dark closet which was black before. She relies on the operated right eye now when she previously relied on the left unoperated eye. She sees more shapes in dark areas now and she sees her face better in the mirror now with the operated eye, which she could not do preoperatively. 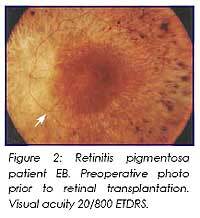 She sees the upper field better than before, which coincides appropriately with the transplanted retinal area of the eye. Sees more clearly. At one year, patient could see objects at night in a car at a distance more clearly. At two years, patient could see more clearly with right eye can’t read or see TV features, but can see the screen clearer with the right eye. She has noted subjective improvement where the operated eye is now her better eye. 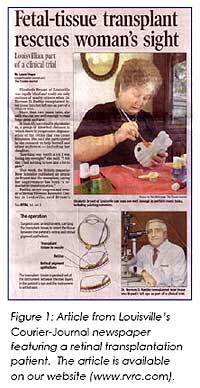 She sees her clock better, and when reading with her magnifier she sees better than she did before surgery. At six months, he sees more light peripherally to the right than he did preoperatively. Corresponds to MP1 test.